Crude oil prices continued to plunge during the first part of yesterday's trading session, with ongoing signs that oil supplies are surging. Some profit taking and a weaker US dollar managed to bring buyers back into the market, but this was not enough to see the futures recoup their losses. 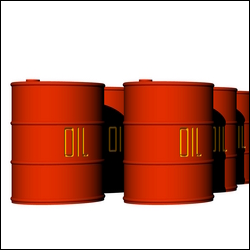 Subsequently, the Nymex crude oil market closed $0.20 in the red at $92.28 per barrel. Amid fresh speculation that demand for jewellery is about to rise, gold prices posted a slight gain yesterday, adding $2.1 to $1,227.7. However, an improving US economy will continue to push investors into higher yielding assets, away from the safety of bullion. By this point, it is certainly possible that many investors will already have insurance against tough times. WTI crude oil prices resumed their slump yesterday, losing $1.42 to $92.46 per barrel and reaching the lowest level for six weeks in the process. Ongoing product supply gains were to blame, with gasoline inventories rising by 6.3 million barrels against expectations for a 2.5 million barrel build. On top of that, the dollar is continuing to rally and we are seeing slight pullbacks in equities, both of which added downside pressure to crude prices. It appears that gold is giving back the slim gains made from the beginning of 2014 as it posted another drop yesterday, settling $6.2 lower at $1,225.5. The Fed's meeting minutes suggested that the genie is out of the bottle; tapering is likely to continue as long as the pace of recovery gains momentum. Unfortunately, this does not bode well for the precious metal. A rebound in stock markets, coupled with a slight weakening of the dollar, offered crude oil prices the chance for a breather yesterday. As such, WTI crude ended its five day plunge, moving $0.25 higher to settle at $93.64. In the background, the deep freeze which is currently affecting the US has understandably raised speculation that the demand for energy will shoot up. In addition, another set of good news for the US economy, represented by the declining trade deficit, has certainly helped the energy's outlook. Unfortunately for gold bugs, the falling US trade deficit supported the view for less monetary stimulus, placing the precious metal under renewed downside pressure. As a result, the gold market lost $6 to close at $1,231.6. The bearish momentum in crude continued to gather pace as WTI posted another slump yesterday, losing $0.55 to $94.17. The main culprit on the day seemed to be the weaker than expected US services growth figure. However, energy investors are also afraid of seeing a supply glut this year as Libya and Iraq seem to be getting back on track and the US pushes for the shale oil revolution. Gold prices ended rather flat around the $1,237 mark yesterday. The metal managed to hold onto the previous two days' gains as investors speculated that physical consumption in Asia will outpace any potential drop in investment demand. An energy report released by the US Energy Information Administration showed big builds in the distillates and gasoline stockpiles, which in turn put further downside pressure on crude oil prices. On top of that, the US dollar is currently on a sharp rebound trajectory which does not help either. As a result, the price of WTI crude oil headed south for the fourth straight session, dropping $1.20 to $94.24. Gold prices ended last year more than 30% down, even dropping below the $1,200 mark during the last trading day of 2013. However, a sustained pick up in the Chinese demand for physical gold has managed to trump a higher dollar and pushed gold back up. It gained $12.9 to $1,236.8 on Friday and is already on the offensive early this morning.